I’ll always remember the day my father introduced me to scuba diving. My brother and I peered over the edge of the boat and were terrified of the potential dangers that raced through our minds, it was paralyzing - and I felt incredibly vulnerable. As I took a deep breath and made the plunge, my fear transmuted into exhilaration and all of a sudden my world expanded. As my skills and confidence increased, I became more adventurous. Now, after decades of diving, I find myself being more conservative as I have more at risk. That day, my father gave me a life-long passion that has rippled into my philosophy and process when it comes to finances. For many, the investment world is multi-faceted and can feel even more daunting than shark-infested water! No matter where you are at, my commitment is that you are empowered in the process and in your decision-making for your financial future. Retirement is too expensive and money mistakes are too costly for you to neglect the future, especially if you have loved ones and family members who depend on you for food, housing, medical care, or tuition. Because we didn’t want a “one size fits all” approach, or to bill you by the hour so that you’re worried about the clock always running, we have three service levels to choose from, as well as a few stand-alone and add-on services. 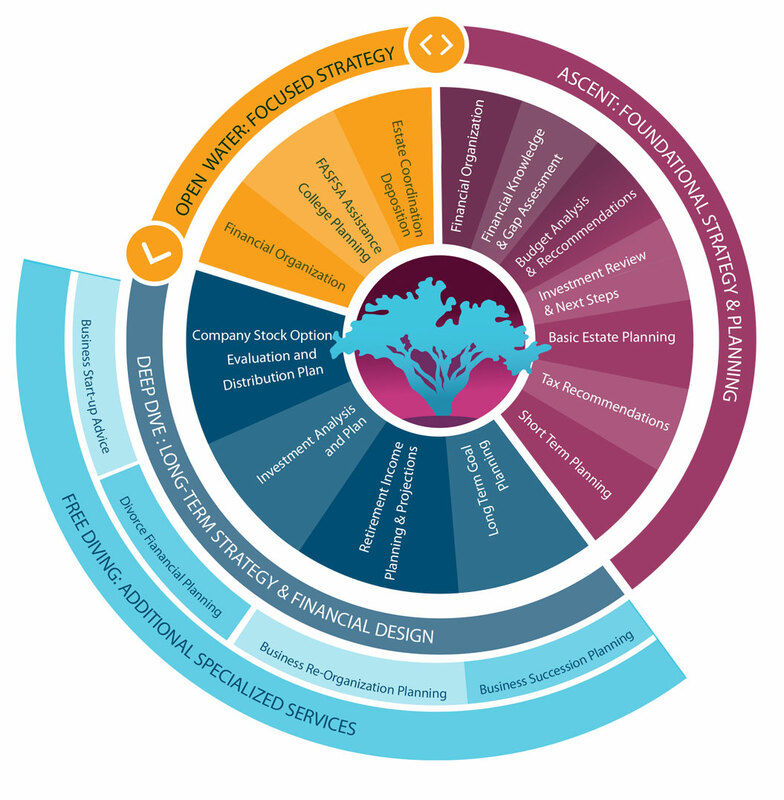 Most of our clients start with one of our financial planning packages. At your initial consultation we will work together to determine which is the best for you, depending on what your desired outcome is and how we feel we can help. Our Financial Planning services do not include investment management. We can help you create your financial plan, even if we don’t manage your investments. But, if you’d like for us to do that for you, as a Fiduciary, we’re glad to help. Our fees start at 1.5% of the assets that we manage and can be reduced from there depending on how much money we invest for you. It’s up to you how we move forward. Regardless, you’ll walk away with a plan and structure that will help propel you towards your financial goals! If you are just starting out, or wanting to “adult” better financially, this provides what you need to point you in the right direction to begin making choices to match your goals. Your needs are more sophisticated and perhaps you have existing investments with your employer or retirement plans. You require expert guidance to maximize your investments. This is for you if you need focused and isolated strategy on a particular aspect of planning, organization or estate needs. These services can be stand-alone or added onto our Ascent or Deep Dive Plans. You have complex finances that require a team to orchestrate and calibrate your investments to your desired goals. The details require dedicated time from diverse resources and parties. Any of these services can be added onto our Ascent or Deep Dive Plans.